A popular tourist area in Martinique, Le Diamant is a scenic resort area dominated by the 574-foot (175m) Diamond Rock, the remnants of a volcano destroyed by erosion. 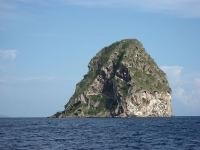 Diamond Rock is a small uninhabited island known for the strategic role it once played in the Napoleonic Wars, when a British garrison fortified it for control over the channel, using the caves to shelter troops. Le Diamant offers some of the best scuba diving in Martinique, including caves and coral reefs to explore in the warm, clear water. Great dive sites include the triangular cavern beneath Diamond Rock itself, but as the currents can be treacherous this is not a dive for beginners. The area also has some beautiful beaches, including Grande Anse du Diamant, and there are a number of restaurants and a shopping centre. The area is popular with tourists and there are many hotels and guest houses to choose from.